No living man ever dreamed that it was possible that the intense joy of the nation over the recent happy deliverance from war could be or would be so soon turned to grief more intense and bitter than ever before the nation had known. Just while the national Capital was in its brightest garb of joy, and while the nation was all pervaded with a generous exaltation, a heavy woe filling every heart with horror and stiffening once more the relaxing grasps of justice, swept over the land, and all the people stood aghast at the damnable deed which, in our hour of triumph, took away the beloved and revered chief magistrate, Abraham Lincoln.
. . . 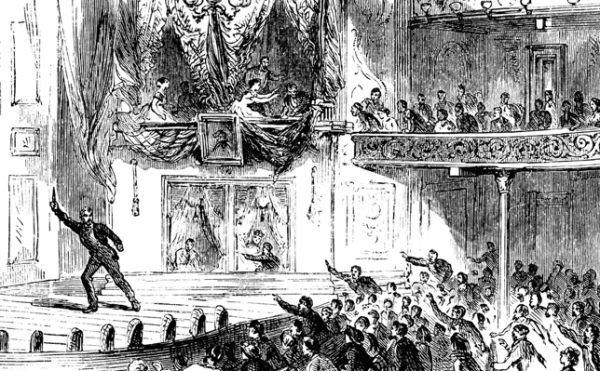 The performance had begun when the President and the party entered and the reception caused a suspension of the play, the enthusiasm being unusually great. They took seats in a double box on the right of the stage as you face the performers and the door was closed. Two women only were on the stage and the second scene of the third act was just begun, when the theater, so often the scene of a mock tragedy, was made the scene of the real one of which the world has never seen parallel since Caesar was murdered in the Roman senate. Ms. Harris looked up and saw Booth enter deliberately but rapidly, walk up behind the president whose face was turned toward the audience and apply a little pistol exactly under the left ear, fire. Oh God! Where was thy providence at that dreadful instant of time? It was but an instant, and dropping his pistol, the murderer flashed out a knife and sprung over the edge of the box and jumped. Then he dropped on the stage falling upon his knees but quickly recovering himself he marched across the stage to the left with that stagy, stilted stride peculiar to his class of actors, shouting “Revenge for the South!” as he went. Gaining the first stage entrance left side he pushed aside Ms. Keene who was about to enter, met an attaché of the theater whose coat he slashed open with his knife, dashed out of the door which he had left open, mounted his horse which a boy had been holding for him, and clattered out into the night bearing with him the mark of Cain, which will brand him to the day of his death. All this happened in a moment of time, and so completely paralyzed was every person that it was an easy thing for the wretch to flee almost un‑pursued; one man only, a lawyer in this city, had a dim idea of what had happened and leaping on the stage he pursued Booth into the alley, saw him knock down the boy who held the horse, mount and ride away into the darkness of the streets. When the audience were roused by the piercing shrieks of Mrs. Lincoln they rushed upon the stage with shouts of “hang him! hang him!” and for a space all was confusion. . . . Surgeons were on the spot and everything was done that could be done to recall the bleeding, dying President to life. Mrs. Lincoln on hearing the report had turned, when, to her horror, she saw the head of her husband fall forward on his breast; he was laid on the sofa at once, but breathed only with difficulty, rattling in his throat. He never spoke or gave any sign of consciousness. The bullet had gone through the skull, glancing obliquely across the brain and lodging under the right eye, where a great discoloration settled. He was moved to a private house opposite, and instantly mounted couriers were scouring the city; horsemen galloped to and fro; the patrol encircled the city, which was a state of terror and alarm. Guards kept the people out of the street where the president lay dying, but crowds anxious, tearful and enraged besieged the place all through the night. . .